1 May 1909: Entered the Army as a Fahnenjunker in Infanterie-Regiment Prinz Friedrich der Niederlande (2. Westfälisches) Nr. 15. 3 November 1913-22 November 1913: Detached to the rifle factory in Erfurt. 1 August 1914-3 September 1914: In the field as a Platoon Leader in Infantry Regiment 15. 14 September 1914-23 May 1916: Transferred to the Replacement Battalion of Infantry Regiment 15. 18 February 1915-23 May 1916: Detached for training Officer Aspirants at Döberitz. 23 May 1916-31 may 1916: Transferred to Infantry Regiment 15 in the field. 31 May 1916-2 October 1916: Company Leader in Infantry Regiment 15. 2 October 1916-27 March 1918: Machinegun Officer on Staff of Infantry Regiment 15. 28 March 1918-12 July 1918: As a result of his wounds, transferred to the 1st Replacement Machinegun Company of the VII Army Corps. 12 July 1918-15 September 1918: Machinegun Officer on Staff of Infantry Regiment 15. 21 August 1918-3 September 1918: Detached to Sub-Machinegun Course in Mons. 15 September 1918-7 October 1918: Commander of the I. Battalion of Infantry Regiment 15. 7 October 1918-11 December 1918: Machinegun Officer on Staff of Infantry Regiment 15. 11 December 1918-15 March 1919: Company Leader in Infantry Regiment 15. 15 June 1919-1 January 1921: Transferred to Reichswehr Infantry Regiment 14. 1 January 1921-24 April 1942: Transferred to Infantry Regiment 18. 24 April 1922-12 April 1923: Captain on Staff of the Training Battalion of Infantry Regiment 18. 12 April 1923-1 July 1923: Captain on Staff of the II. Battalion of Infantry Regiment 18. 1 July 1923-1 October 1927: Chief of the 8th Machinegun Company of Infantry Regiment 18. 5 May 1924-28 June 1924: Detached to Transport and Equipment Course with the 6th Transport Battalion. 2 October 1924-18 October 1924: Detached to the Machinegun Course in Sennelager. 2 November 1925-28 November 1925: Detached to the Combat School Course in Döberitz. 1 October 1927-1 October 1929: Chief of the 7th Company of Infantry Regiment 18. 1 October 1929-1 March 1931: Transferred to the staff of the Training Battalion of Infantry Regiment 18. 1 March 1931-1 October 1934: Adjutant of the Commandant of Troop Training Area Senne. 15 October 1935-12 October 1937: Commander of the II. Battalion of Infantry Regiment 64. 12 October 1937-10 November 1938: Transferred to the staff of Infantry Regiment 79. 10 November 1938-26 August 1939: Commandant of Cologne. 26 August 1939-10 February 1942: Commander of Infantry Regiment 193 of the 69th Infantry Division. [Commanded by Generalmajor Hermann Tittel, the 69th Infantry Division took part in the invasion of Norway in April 1940 and thereafter remained in that country as part of the occupation forces until December 1942.]. 10 February 1942-1 March 1942: Fortress Commandant Tromsø, Norway. 1 March 1942-27 April 1942: Fortress Commandant Stavanger, Norway. 27 April 1942-10 November 1944: Commander of the 280th Infantry Division in Norway. 10 November 1944-1 December 1944: Führer Reserve in the Army High Command. 1 December 1944-11 January 1945: Commander of Division Nr. 526 in Germany. 11 January 1945-9 April 1945: In hospital. 9 April 1945-13 December 1945: Prisoner of war in British captivity. 30 May 1946: Cleared by the British Court Martial. 20 November 1947: Released from internment. 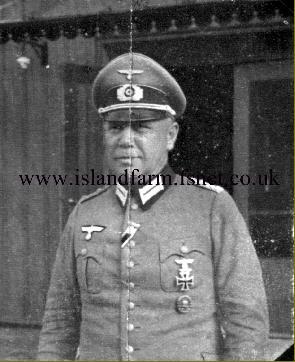 Click here to see photos of Generalleutnant Karl von Beeren in the company of fellow prisoners of war at Island Farm.